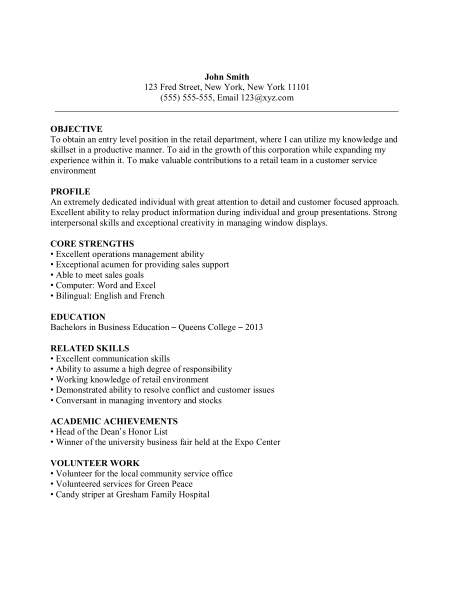 The Customer Service Sales Resume Template is a document with a preset format conducive to creating an attractive resume. A resume is how one presents their professionalism and desire to obtain a position with a specific establishment. This document is the first at-a-glance contact a prospective employer will have of a candidate and thus will be instrumental in determining whether someone will be called for an interview or not. Every resume is composed of several parts meant to convey information to the employer. After reading a resume, prospective employers should know the Contact Information, Goals, Qualifications, previous Experience, and Education that an applicant will bring to the position being applied for. These may be the basic sections a resume contains however depending on one’s personal needs it may be tailored with additional sections or different ones altogether. The goal of a resume is to represent a candidate accurately and gain him/her an interview for the position he/she desires. Step 1. The top of the page is reserved for the applicant’s contact information. It is customary to have this centered. Here, enter the name, address, phone number, and email information for the candidate. Step 2. This should be a goal oriented document. Thus, two spaces below the contact information create a section titled “Objective,” “Career Focus,” or simply “Goal.” This is the first impression the person doing the hiring will have so make sure it is concise and to the point. Step 3. If you have some prior work experience, the next section “Experiences” should be a bullet point style summarization. However if you are truly entry level with little to no work experience the next two sections should be about yourself and your strengths. These sections may be called the ‘Profile’ and the ‘Core Strengths’ sections. Step 4. The next section should list your education. It is aptly titled ‘Education.’ Here, list not only the standard educational institutions you have attended (High School, College) but also any trade schools that may apply. Step 5. The next two sections should attempt to support the previous two. List any skills which may apply to a retail positon in the ‘Related Skills’ Section and any notoriety received in schools in the ‘Academic Achievement’ sections. Step 6. If the candidate has volunteered in any organizations list that experience in the ‘Volunteer Experience’ section.